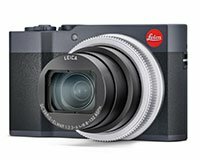 Leica has announced the new C-Lux premium compact travel zoom camera. The C-Lux is essentially a Panasonic ZS200 camera, utilizing the same 20.1-megapixel CMOS sensor and built-in 15x zoom lens, which offers a 35mm-equivalent focal length range of 24-360mm. The camera has a built-in 0.21-inch 2.33-million dot electronic viewfinder, a 3-inch touchscreen and a stylish design. The C-Lux differs from the ZS200 in a few ways. The C-Lux has a leather that spans the entire front of the camera, for example, and opts for a different style for dials and buttons. The C-Lux includes a five-way optical image stabilization system and can shoot at up to 10 frames per second. The ISO tops out at 25,600 and the C-Lux can record 4K video at up to 30 frames per second. The camera also features built-in Wi-Fi and Bluetooth technology. Alongside a portfolio of new accessories, including camera cases and straps, the C-Lux will release in mid-July in two colors, light gold and midnight blue. The camera will retail for $1,050 USD, which is around $250 more than the ZS200. You can preorder the camera via the links below.